A Paris residents' association has awarded its prize in a virtual competition on Second Life involving ideas to redevelop an area of the city. The winner receives 275,000 linden dollars (785 euros, £530), the currency used in the online world. Although the winning project is French, people in China, Canada and Germany took part and came up with ideas for a new garden in the central Halles area. Mayor Bertrand Delanoe revealed plans in 2004 to revamp the area. But local residents' association Accomplir (Accomplish) says residents have not been consulted over the gardens which they say are at the heart of local life. The main prize in the competition went to Joshua Culdesac and Piper Pitney for ideas which include ambitious water features and an ice rink. Smaller prizes were also awarded, including 40,000 linden dollars to a six-year-old in the children's play area category. The other categories were sculpture design, a connection to the public transport network and a public toilet. Some of the participants in the competition spent up to a month working part-time on their entry, says Accomplir vice-president Gilles Pourbaix. 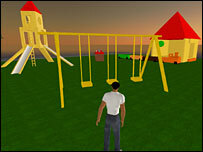 The association had urged locals to come up with their own ideas for the area's gardens and to post them in the online world of Second Life, where people create virtual doubles of themselves called avatars. The winning projects are displayed on an island in Second Life. Accomplir hopes the competition will go towards putting some pressure on Paris officials to speed up the redevelopment process. However, Mr Pourbaix says he is not expecting any of the contest ideas to be adopted as they do not take into account real-life conditions. Les Halles was the central wholesale market for the Paris region until the 1970s when it was razed to the ground to make way for a shopping centre. It is also a major underground hub. Redevelopment plans for the area include renovating the garden. How grand is mayor's Paris vision?